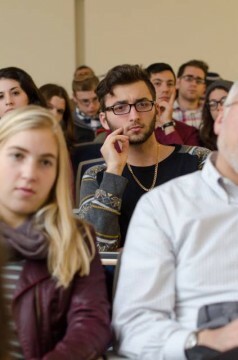 On December 15, Yeshiva University students hosted a distinguished panel about the political and human dimensions of the Syrian refugee crisis on the Wilf Campus, presented by the Jay and Jeanie Schottenstein Honors Program, Schneier Program for International Affairs, YU Tzedek Society and YU Social Justice Society. Panelists included Zaina Erhaim, an award-winning journalist and documentary maker from Aleppo, Syria; Muzaffar Chishti, a New York University School of Law professor and director of the Migrant Policy Institute at NYU; and Marco Lauder, head of the Department of Economics at the German Consulate. 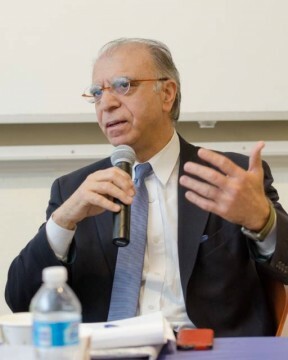 Dr. Mohamed Kamal al-Labwani, a prominent member of the non-partisan and moderate Syrian opposition to Assad’s regime and founder of the non-partisan think-tank Damascus Institute for Research, encountered last-minute visa problems and was unable to attend. Chishti stressed the need for shared responsibility by the international community in addressing the crisis, whether by taking in refugees or providing for their material welfare. Chishti also described organizations within the United States that work to help refugees, including the International Rescue Committee, Human Rights First and the International Refugee Assistance Project. Four million Syrian refugees currently live in neighboring countries, such as Lebanon, Jordan and Turkey, though not all Middle Eastern states have been as welcoming. 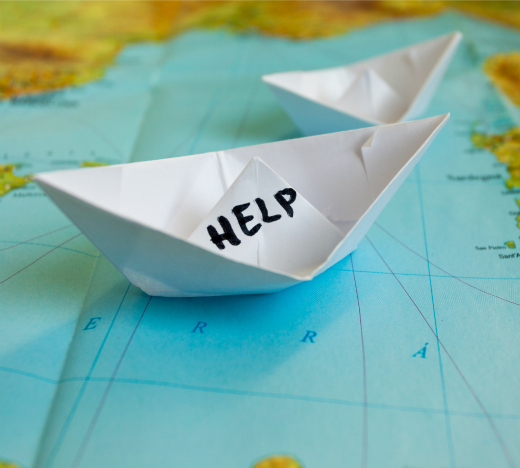 European countries have also provided asylum to large numbers of refugees. By the end of 2015, Germany alone will have taken in 1 million refugees—80% from Syria—with 10,000 people arriving per day at the peak of the influx. Recently, the number has inexplicably decreased to 4-5,000 per day. “This refugee crisis completely changed the face of Europe, and the face of my country,” said Lauder, adding that all European Union member nations must eventually come to an agreement about how to share the responsibility among them. Chishti noted that Secretary of State John Kerry has suggested that the U.S. should welcome 85,000 Syrian refugees, though advocacy organizations believe the number should be increased to 100,000. According to Erhaim, 5 to 6 million Syrians will be stateless within a couple of years, because Assad’s regime refuses to issue passports and other official documentation to Syrians living in rebel-controlled zones or as refugees abroad, including children being born to Syrian refugees. Erhaim herself will become stateless within several months because her passport has run out of blank pages and she will not be able to renew it. She believes that foreign pressure, heretofore absent, might force the regime to reverse its policy and start reissuing vital documentation to its citizens. The panel also discussed security concerns relating to the refugee crisis, which have featured prominently in the media. Chishti, who has testified on immigration issues before Congress on numerous occasions, noted that out of the 784,000 refugees the U.S. has taken in since September 11, 2001, only one was ever tried for involvement in a domestic plot—and the charge has been overturned. “It takes [refugees] 18 to 24 months to be brought to the U.S. only because of security,” said Chishti. “In terms of the robustness of our protection system, we’ve never seen a more robust system.” Chishti described the rigorous screening procedure of refugees’ names and biometric data, in addition to their needing to prove that they have no ties to terrorist organizations or their supporters. Erhaim noted that most ISIS fighters and terrorists within Syria are Western-born, and those within Europe are homegrown. The event was coordinated by Dina Chizhik ’16S, Yosie Friedman ’17YC, and Dr. Gabriel Cwilich, director of the Jay and Jeanie Schottenstein Honors Program. YU Provost Selma Botman introduced the event, and Dr. Ruth Bevan, chair of YU’s Political Science Department, served as moderator.